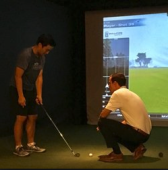 Shaun Clark is a PGA professional offering private golf lessons using a full-swing golf simulator in the Manhattan area. Shaun’s lessons are perfect for those New York citizens who simply are limited for time when it comes to practicing or playing golf. He is committed to sharing his love of golf through coaching and training to those who share the same passion. He also rents out his simulator for practice hours, as well as corporate and private events. Contact Shaun today for more information!